McDonald’s South Africa is piloting a mobile payment service at select restaurants in Johannesburg and Cape Town using social messaging app WeChat Africa, enabling customers to complete purchases by presenting QR codes generated by the app at the point of sale. To mark the launch of Quick Pay, WeChat is also giving the first 20,000 McDonald’s customers 50% cashback when using the service to pay for their meal. “We are continuously searching for innovative ways to enhance our customers’ experience,” says Daniel Padiachy, chief marketing officer at McDonald’s South Africa. “We believe that WeChat’s Quick Pay will further assist us in upholding these principles. WeChat was launched in South Africa in November last year by Chinese ecommerce giant Tencent in partnership with Standard Bank. The service lets users make P2P transfers, pay for services such as airtime, data and electricity and make in-store payments by scanning QR codes at 30,000 merchants supporting the SnapScan mobile payments platform. 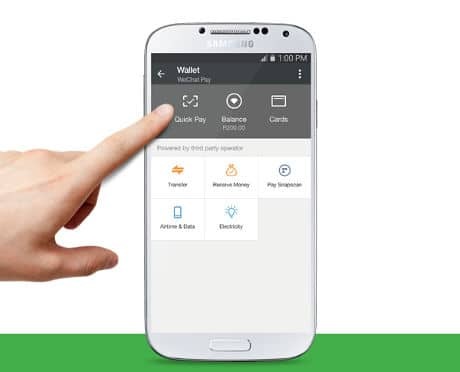 Quick Pay will stand alongside the SnapScan feature within WeChat, the company confirmed to NFC World. Only Quick Pay currently works at McDonald’s locations. “Although Quick Pay is innovative, it also offers customers a much faster and easier payment option to traditional payment,” says WeChat Africa CEO Brett Loubser. WeChat began offering in-store payments at nine Chinese merchants in September 2014. Tencent reported that more than 200 million customers have added their bank cards to its QQ Wallet and Weixin Pay mobile payment platforms in November 2015. As much as I prefer NFC as a user, as a promoter of mobile payments, I have to acknowledge that far more mobiles are capable of QR than of NFC. For them, it is simply a matter of software. On the merchant side, it requires hardware. While many merchants already have the hardware for loyalty card applications, it remains to be seen how many will upgrade for payments. At Starbucks, where I can use NFC, QR, or barcodes, I usually choose Apple Pay; it hides my credit card number from Starbucks. I have to pay Starbucks in advance to use the Starbucks app but doing that with Apple Pay, I do hide my credit card number. When you are Starbucks or McDonlads the issue is to take the money in the fastest manner that the customer is equipped for. In the US, that is anything but EMV.